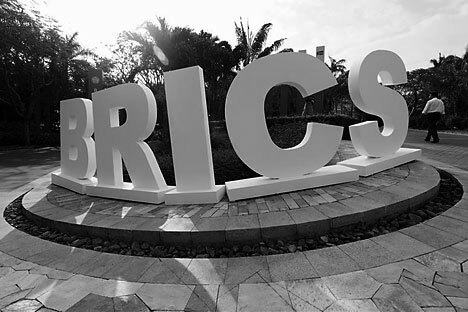 Most experts welcome the rapprochement between the five BRICS countries (Brazil, Russia, India, China and the recent newcomer, South Africa) and the decisions taken at its summit in China, but they doubt that the decisions will be fulfilled. At their meeting in China, the BRICS countries decided to pool their efforts to combat the volatility of world commodity and food prices. They signed an agreement on financial cooperation, including through mutual loans in national currencies. “In practice, the summit’s decisions, especially in the economic field, will be difficult to implement”, says Lidiya Grishayeva, associate professor at Moscow University’s History Faculty, who specialises in Russia’s participation in international organisations. “The BRICS countries all differ in terms of economic development.” She stresses that the BRICS decisions are the result of compromise and that they are not legally binding. Vladimir Pankov, who holds the Chair in International Economic Relations at the Higher School of Economics, also admits that dramatic price fluctuations destabilise the world economy (as has been very evident over the last three years), making it vital to diminish volatility of commodity and food prices. But there are few opportunities for doing this. “There are no international mechanisms for influencing commodity prices. The tools that do exist involve some countries and sectors but, on the whole, they make very little difference to the overall volatility of commodity and food markets”, he notes. Mr Pankov believes that the BRICS countries could exert some influence on world prices by agreeing commodity and food export and import volumes. “But one has to bear in mind”, he notes, “that countries within the bloc have very different interests and potentials. Russia, for example, exports 11% of the world’s energy resources while consuming only 5.5%, whereas China has a huge oil deficit.” Nevertheless even a statement of intent is to be welcomed, Mr Pankov stresses, because “it will send a signal to other countries”. Another economic outcome of the summit – the signing of a framework agreement on interbank cooperation among the BRICS countries – met with less scepticism within the expert community. In the opinion of Alexandra Lozovaya, deputy chief of the Analytical Department with Investkafe Agency, such cooperation will, in the medium and long term, promote trade between BRICS countries and their economic integration. “We are talking about opening credit lines for each other in national currencies, including for servicing trade between these countries”, Alexandra Lozovaya explains. “Settlements in national currencies will, in my opinion, speed up transactions and help to preclude currency conversion risks (risks of currency exchange losses – eds.)”. She also believes that, in the long term, such cooperation will increase demand for the BRICS countries’ own currencies. On the whole, BRICS summits are very useful because they “chart the paths for independent solutions to economic crisis situations without pressure from the G7 countries, which take a jaundiced view of the prospects of a stronger BRICS,” Professor Grishayeva of Moscow University believes. In addition, being a participant in the summit allays Russia’s fears of being excluded from BRICS because of its falling economic growth rate, she believes. Other observers take a more favourable view of the alliance. “In spite of the prevailing scepticism regarding BRICS, the group has convincing and heady prospects,” says Ms Grishayeva. While Russia has long had joint economic projects with China and India, Brazil and South Africa are “totally new markets, offering new opportunities for economic cooperation”, she notes. Alexandra Lozovaya of Investkafe points out that the BRICS countries are already outstripping G7 in some ways. For instance, in 2010, Brazil’s foreign debt stood at just 15% of GDP, Russia’s at 33%, India’s at 20% and China’s at 7% (for comparison, the figure for the US is 97%, Germany 159%, France 188%, Japan 162% and Britain 416%). In addition, BRICS has greater sovereign reserves and capacity to cover national debt. The ratio of sovereign reserves to foreign debt is 83% in India, 94% in Brazil, 100% in Russia and 645% in China, the analyst notes.